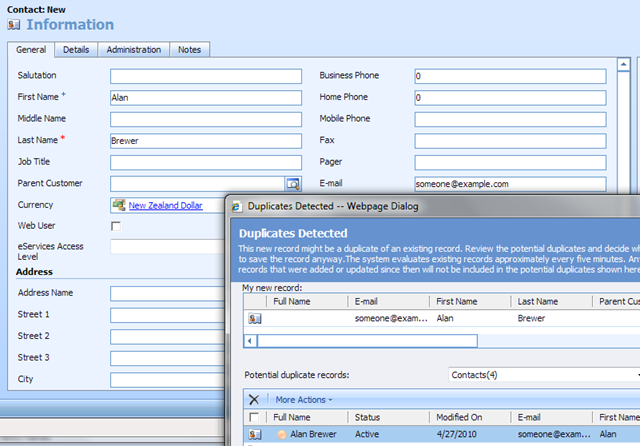 Microsoft CRM comes with a real time duplicate checking engine that warns users of potential duplicates as they enter new records. Sounds good doesn’t it? However, it’s not a comprehensive solution and has a few weaknesses especially when you start dealing with large numbers of customer records where the likes of good old John Smith starts to pop up a lot. But with a bit of targeted customisation you can get it working for you. Now if you publish this rule and then push through a test you will find the duplicate checker doesn’t report a suspected duplicate when you expect it to. What CRM is doing here is its creating a match code for each Contact in the database based on the rule you defined. In this case the match code string will be “<contact.fullname><contact.emailaddress>”. The duplicate checker is then able to check against this one field to find duplicates. CRM actually creates a new SQL table to house this matching data. So, you need to let CRM complete that step, then you can retry your test. But, again you will find the duplicate checker doesn’t appear to be working. The problem appears to be an issue of timing. The duplicate checker appears to be reading the ‘”Full Name” of the Contact being entered before CRM has actually calculated what that is (based on the First Name and Last Name fields that were entered). Again, wait for CRM to rebuild it’s match code table, and then retry your test. I mentioned customisation earlier and we haven’t had to do any yet, and yet it looks like we have this working now. One problem. Try entering a new Contact with the same name as an existing contact where neither of the Contacts has an email address. In this instance the duplicate checking engine will consider this to be a match. So, in the absence of email addresses we are now matching on name alone. If dealing with a lot of customers then this will result in a lot of false positives being reported, which frustrates users, who start to pay less attention to the duplicate detection dialog box. And it then looks up that match code in its match code table, and find record # 3. Next post, I’ll show you to address this. This entry was posted in Uncategorized and tagged 4.0, crm, duplicate on April 27, 2010 by Gareth Tucker.